I use the diagram below in workshops to explain the logical path a lead should follow to participate in your fully developed Marketing Hourglass. 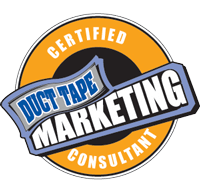 This concept is one of the key elements of the overall Duct Tape Marketing system, but I could conduct entire workshops around this one slide as it seems to be the easiest way to explain the marketing process in simple and practical terms. When you overlay our definition of marketing – “getting someone who has a need to know, like, and trust you” with the act of turning know, like and trust into try, buy, repeat, and refer, you get a much more logical path for moving someone from initial awareness to advocate.